All Californians have a right to safe, clean, affordable and accessible water under the “human right to water” established in state law in 2012. 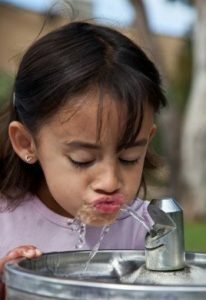 While significant progress has been made toward realizing this right, there is both an urgent need and an important opportunity to take additional actions to help ensure that all California communities have access to water that meets the health-based standards of the state and federal Safe Drinking Water Acts. • Innovative New Policies that Empower Effective Local Agencies. Effective local agencies are key to the development and implementation of sustainable drinking water solutions. California can make significant progress toward addressing this important health and safety issue by empowering local agencies in the areas of the state that need assistance. In 2018, the Legislature approved AB 2050 (Caballero), which is one example of a policy to empower local agencies. While AB 2050 was ultimately vetoed, it would have created an innovative new option for water system governance by enabling multiple noncompliant drinking water systems to consolidate to form a larger “small system water authority.” Under a responsible water authority, these systems would benefit from larger economies of scale, expanded ratepayer bases, operational efficiencies, and enhanced funding opportunities. In the past several years, two new laws—SB 88 (2015) and AB 2501 (2018)—have also enhanced the state’s authority to mandate the consolidation of disadvantaged communities that lack access to safe drinking water into adjacent water systems. The appropriate use of this authority can help deliver safe drinking water solutions to some impacted communities. Through all of our members’ efforts to manage water in the Sacramento Valley for multiple beneficial uses—including water for cities and rural communities, farms, fish, birds, and recreation—NCWA has found that locally-developed collaborative solutions provide the most successful path to addressing water management challenges. Consistent with this experience, policy approaches like AB 2050 can empower local entities to develop and implement solutions that are tailored to their specific needs. In 2018, NCWA joined with the California Municipal Utilities Association and others to advance policies that would empower local agencies to effectively address these issues. We will continue these efforts in 2019. • Effective Funding to Address Needs Statewide. In recent years, NCWA has advocated for the development and deployment of effective funding sources to support access to safe drinking water that do not rely on a regressive water tax. Water leaders in the Sacramento Valley actively supported the development and passage of recent bond measures including Proposition 68 (2018) and Proposition 1 (2014). These measures included a combined $770 million for safe drinking water and wastewater projects, as well as significant funding for sustainable groundwater management and other designated funds for disadvantaged communities that will assist in the provision of safe drinking water. In 2018, NCWA also supported the inclusion of $23.5 million in the 2018-19 State Budget for key safe drinking water actions over the next year, including $3 million for the SWRCB to conduct a statewide drinking water needs assessment and an additional $6.8 million for the SWRCB’s “Safe Drinking Water for Schools” grant program. These existing funding sources provide a foundation for the development of a long-term funding solution. In January 2019, Governor Newsom’s 2019-2020 State Budget proposal included $10 million in general fund for emergency water suppliers and $10 million in general fund for technical assistance to provide administrative, technical, operational, and managerial services to achieve compliance with current drinking water standards. In addition to supporting these important allocations, NCWA will work to secure state resources and a sustained investment strategy sufficient to address the known capital and ongoing operations and maintenance funding needs of communities that lack access to safe drinking water. • Constructive Efforts to Improve Rural Water Quality. Several agricultural organizations have worked with environmental justice representatives and other partners to develop constructive provisions related to agricultural funding and enforcement protections to address specific issues associated with providing safe drinking water in rural communities, including nitrate contamination. During the 2017-18 legislative session, the proposed “Safe and Affordable Drinking Water Act” (including SB 623 (Monning) and several successor measures) included these important provisions. • Implementation of Regulatory Programs. The Sacramento Valley, through its water quality coalitions, has been implementing waste discharge requirements through the Irrigated Lands Regulatory Program and Basin Plan Amendment. These programs have and will continue to improve water quality in the region. Moreover, these programs and others will also protect water quality to ensure that safe and clean water is fully protected in the Sacramento Valley. • Addressing Specific Community Needs through Local Efforts. NCWA, through its Board of Directors representing local water agencies and counties, is committed to continued work within the Sacramento Valley to help ensure that water systems currently out of compliance can make progress toward meeting all relevant state and federal standards. 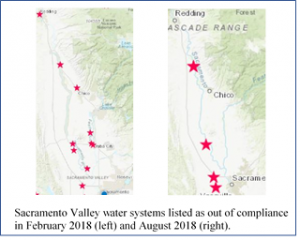 With a sustained focus on entities that were in violation of one or more primary drinking water standards, the number of water systems listed by the SWRCB as out of compliance in the Sacramento Valley was significantly reduced in 2018 (see inset maps). These efforts to return water systems to compliance through local actions under existing state programs will continue in 2019. In sum, NCWA will continue to advocate for a comprehensive policy approach to addressing safe drinking water that empowers effective local agencies, targets funding to address specific needs, and emphasizes collaborative locally-appropriate solutions to enable continued progress toward ensuring that all Californians have access to safe drinking water. As we move forward, we would welcome any thoughts, suggestions or ideas that will help advance these important efforts. Please provide your thoughts to arobin@norcalwater.org.